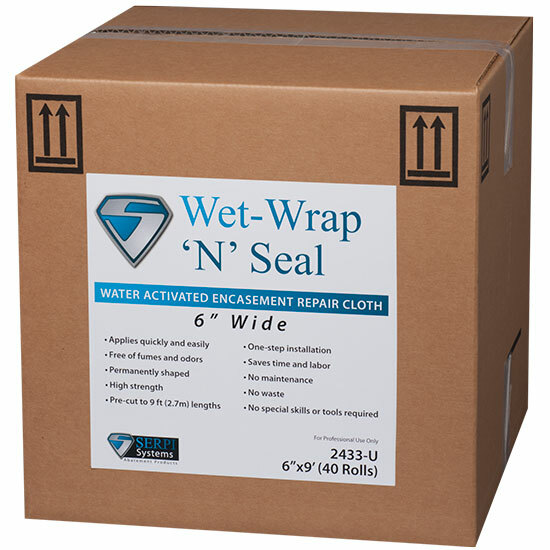 Wet Wrap ‘N’ Seal is a permanent insulation encasement and repair system that quickly and easily covers pipes, breeching, valves, duct work and other fittings. Once dry, it permanently retains its strength, shape and form. Using Wet Wrap ‘N’ Seal followed by applying a bridging encapsulant satisfies procedures specified by the National Institute of Building Sciences for the proper repair of insulation and lagging. For a bridging encapsulant, use SerpiMastic, Lag Kote or Lag Kote II. Prior to application it is important to determine if the existing asbestos matrix is well adhered to the substrate. Correct any surface defects and clean all surfaces thoroughly. Be careful not to agitate asbestos fibers during preparation; this could increase asbestos exposure. If damaged, first apply a light collating of SerpiFlex followed by a second application. The second application should saturated the damaged area. Apply additional fiberglass, mineral wool or insulation cement to treated area if needed. Application Water in pail must be clean at all times. This product is a plaster of paris and synthetic resin combination. Use of skin protection or gloves is recommended. Hold loosely and submerge one Wet-Wrap ‘N’ Seal roll at a time in clean, tepid water (68°F/20°C) for 5 seconds. Keep thumb under edge of Wet Wrap ‘N’ Seal to avoid difficulty in finding starting end after squeezing. Remove and squeeze with twisting motion to wring out excess water, keeping thumbs under starting end. When applying overlap each layer by 50%. Smooth each overlap turn of Wet-Wrap ‘N’ Seal into the layers below, molding carefully to the contour, forming a solid, well fused covering. Note: For leather-tough protection and added strength, you can apply SerpiMastic over the Wet-Wrap ‘N’ Seal after it is dry. Wet-Wrap ‘N’ Seal will set in 2-4 minutes. Setting time is measured from the point when the product is immersed to the point when it can no longer be molded. Increasing or decreasing the temperate of the immersion water by 9°F (5°C) will reduce or extend the setting time by approximately 15 seconds. Cleanup Tools and drippings should be cleaned with warm soapy water before adhesive dries. Dispose of waste according to all existing local, state and federal regulations. Store in a dry place. Approved respirators must be used to prevent inhalation of asbestos fibers that may be present in the air. Protective clothing should be worn. Asbestos abatement activities must be performed in accordance with all applicable regulations including EPA, OSHA, federal, state and local. For more information always contact the appropriate agencies prior to beginning any abatement project.